About 30 minutes prior to boarding time, I left the Japan Airlines First Class Lounge in terminal 2 and made my way to gate 63. I arrived at the gate with a few minutes to spare and was glad to see there was no secondary inspection for my flight back to the United States. I snapped a few pictures, took a seat and waited for boarding to be called. It really amazes me how efficient the Japanese are with their boarding process. Because there were agents in place to help answer questions and direct passengers to their appropriate lanes, the entire boarding process was smooth, efficient and orderly. Boarding started on-time with First Class passengers, Business Class passengers and oneworld elite members. First Class passengers boarded the aircraft through door 1L and all other passengers boarded through door 2L. This was great for First Class passengers as it really allowed the flight attendants to assist the passengers in a calming and relaxing environment. Upon entering the aircraft, I found the Japan Airlines First Class cabin to be bright and airy but a little on the bland side. The leather seats and wood finishes were clean and sophisticated but the decor of the overall cabin lacked color and personality. With only eight seats in the entire First Class cabin, the space felt very private and exclusive. On this flight, four of the eight seats were occupied and there were three flight attendants and one purser working the First Class cabin. I was seated in seat 2A, a window seat on the left side of the plane. There are two rows of seats in a 1 x 2 x 1 layout. 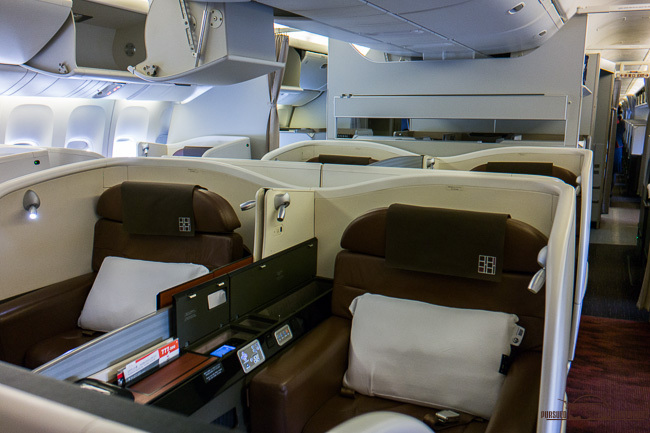 The Japan Airlines First Class open suites are similar to the First Class seats found on Air China’s Boeing 777-300ER and Thai Airways’ Airbus A380. Compared to the First Class seats on Air China and Thai Airways, Japan Airlines has the widest seat with 33 inches of width (26.5 inches for Thai Airways and 23 inches for Air China) and a true lie-flat bed length of 6.5 feet. 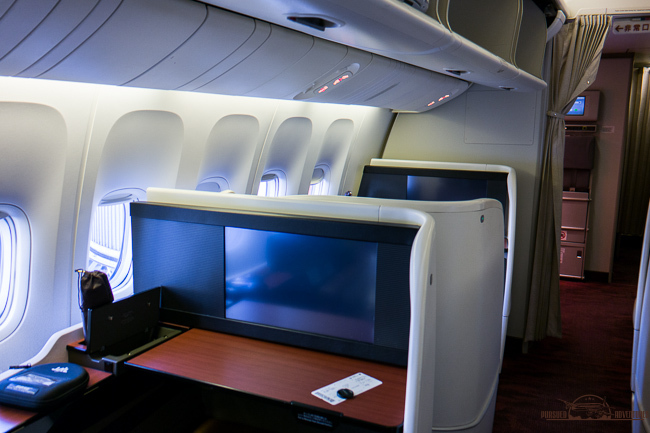 Each seat is equipped with its own personal Audio Visual On-Demand (AVOD), in-flight entertainment (IFE) system, an in-flight telephone, universal electrical outlet, USB port and three personal reading lamps. The reading lamp doubles as a headphones hook to keep your headphones secured during flight and the wires from getting tangled. WiFi was also provided on this flight for a fee. The single window seats are perfect for solo travelers and the middle seats are great for couples traveling together. The seats are not fully enclosed but are still incredibly private. While seated in my seat, I couldn’t see any of the other passengers in the cabin. The middle seats have wide armrests and a full-length, privacy divider that can be raised to separate the two passengers. The ottoman doubles as a guest seat and the movable tray table is large enough for two people to dine together. Japan Airlines First Class seats are incredibly spacious and have a ton of storage spaces. In addition to the overhead bins, the space underneath the ottomans and the deep bins next to the armrests, there are plenty of small pockets at the seat to keep your passport, cell phone, laptop and other electronics handy. The seat controls are intuitive and convenient and the liquid crystal, touch control IFE remote is responsive and easy is to use. Directly behind the First Class cabin (separated by a fixed bulkhead and curtain) is a mini-cabin of just seven Business Class seats. If you’re booked in Business Class, these are the seats to book as they are located forward of door 2L and separate from the main Business Class cabin. These are the new JAL “Sky Suite” Business Class seats. They offer a ton of privacy, have direct aisle access for all passengers, 25.5 inches of width and 74 inches of pitch. 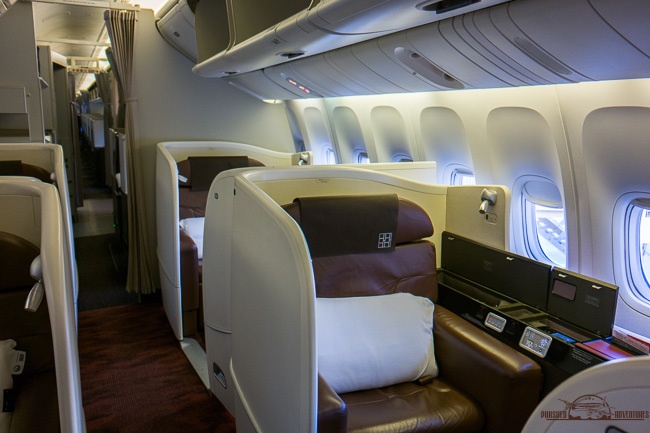 Behind the main Business Class cabin is the Premium Economy Class cabin with 40 seats in a 2 x 4 x 2 layout. The Premium Economy seats offer 19 inches of width, 42 inches of pitch and a couple extra inches of recline. Behind the Premium Economy cabin are two Economy Class cabins with JAL’s new “Sky Wider” seats in a 3 x 3 x 3 layout. Sky Wider seats offer 19 inches of width and 34 inches of pitch. Those are some impressive numbers! Waiting at our seats were a pair of slippers, a full-size pillow and set of Bose noise-cancelling headphones. As I was taking pictures and playing with my seat, the purser came by to introduce herself. She addressed me by name and welcomed me on-board. She then offered me a warm towel, pre-departure drink (champagne or orange juice from a tray) and a set of pajamas. I usually don’t change out of my street clothes until after we take off and hit our cruising altitude (just in case we need to exit the aircraft in an emergency or something) but the purser insisted that I would be more comfortable for the flight. She was very persuasive and I agreed to change out of my street clothes. She escorted me to the lavatory, opened the door for me and waited outside as I changed. The JAL pajamas were soft and comfortable but a little on the heavy side as I later found the cabin to be very warm. As I stepped out of the lavatory, the purser asked for my clothes so she could hang them for me. There are two lavatories for First Class passengers and they are both located in the front of the plane. The First Class lavatories are slightly larger than standard lavatories and are stocked with dental kits and mouthwash. But what I really appreciate about the lavatories are the full length mirrors and the two benches for changing. There is a bench to sit down on and a bench to stand on so that you don’t have to stand on the wet floor. How brilliant is that? And yes, the toilet is equipped with a bidet function as well if you’re comfortable using that sort of thing. After all the passengers were boarded, we pushed back from the gate, made our way to the runway and began our 9 hour and 34 minute journey to Los Angeles. Once we reached cruising altitude, the seatbelt signs were turned off and the flight attendants came by to pass out menus and take drink orders. The flight attendant came back a few minutes later to set my tray with a table cloth and serve my pre-meal drink with a packaged snack mix. It should be noted that Japan Airlines First Class has a dine on demand service so you can eat whatever you want, whenever you want. However, I stuck with the recommended meals at the recommended times. My rule of thumb is to always choose the ethnic meal options for whatever airline I’m flying on as I find them to usually be better than the western options. However, I wasn’t all that impressed with JAL’s Japanese menu on my last flight. Because of that, I decided to mix it up this time and go with the western menu instead. Dinner started with an unidentified amuse bouche. It wasn’t listed on the menu but it was some sort of clam starter with a side seaweed eggroll and radish, maybe? I didn’t really know what it was but it didn’t taste that great. After that, my table for formally set and another amuse bouche of green asparagus, mozzarella and “duck raw ham scented with lemon” was served with an assortment of bread from a basket. The items were beautifully presented but the “duck raw ham” tasted like you would expect it to taste. We were 0 for 2 and Japan Airlines First Class catering was not off to a very good start. For my appetizer, I went with the caviar with salmon and scallop tartare. And just when I was really doubting Japan Airlines First Class catering, this amazing caviar service totally redeemed everything I tried to eat earlier. This caviar service really blew me away as the rich flavors of the tartare really paired well with the saltiness of the caviar. It was absolutely amazing and was by far, the best caviar service I have ever had on an airplane. Notice the mother of pearl spoon also. For my main meal, I went with the petit ragout of lobster, cabbage, chanterelle and bacon. I didn’t really know what to expect but it was fantastic. It was a stew type of dish with huge chunks of lobster and cabbage. It was savory, plentiful and totally hit the spot. For my alcoholic drink, I went with the champagne which was a Salon Le Mesnil (which retails for $450 a bottle). For dessert, there was only one option of strawberry and coconut blanc-manger with raspberry and strawberry granite. It sounds pretty fancy but in reality, was just a mousse with fruit toppings. It was simple yet tasty and worked well as a palette cleanser after that flavorful meal. This was followed by a warm towel and a boxed piece of chocolate. The meal service was appropriately paced and the flight attendants came around frequently to refill my drinks, serve food and clear out plates. Nothing sat on my table longer than a few minutes after I was done with it and my glass was never more than half empty. With four crew members helping four passengers, you can imagine service was very attentive and personalized. The food was plentiful and beautifully presented but some items tasted better than others. The caviar service and main meal were absolutely amazing and ranked as two of the best dishes I have ever had on an airplane but everything else (including my pre-arrival meal) fell a little flat in the flavor department. After dinner, my plates were cleared and the flight attendants then handed out amenity kits. The Japan Airlines First Class amenity kits are top notch. In addition to the unisex, Loewe branded case that doubles as a hanging toiletry kit, each First Class passenger also received a gender specific facial product kit from Japanese cosmetics firm, Sheshido. Amenity kits don’t get much better than these. Inside, you’ll find a Loewe branded lip balm, eye shades, earplugs, moisture mask, comb, package of tissues, dental kit and Shiseido branded face wash, toner and moisturizer. Click here for my complete review of the Japan Airlines first class amenities kit. After I finished exploring the amenity kit, the flight attendant came by to ask if I wanted my bed made. I wasn’t ready for sleep yet but wanted to watch TV in bed so I agreed to have my bed made. She then offered me a choice between a soft or firm memory foam mattress pad. I went with the firm. Turn-down service included the mattress pad, second full-size pillow, duvet and a large bottle of water. Just look at this bed. It’s almost the size of a twin size mattress! I laid in bed, watched Gone Girl (it was horrible, btw), and was asleep before I even knew it. Without trying to, I slept for a solid five hours. The mattress pad was amazing and was one of the most comfortable night’s rest I have ever on an airplane. For those of you with wide shoulders, you will really appreciate this seat. Not only is the seat wide in of itself, but in bed mode, the armrests also retract to provide additional shoulder room. Entertainment-wise, the large IFE screen was clear and crisp but there was a very limited selection of western movies. The 13 “new” movies included titles such as Bird Man, Gone Girl, Interstellar, Big Hero 6 and the Equalizer. In addition to the movies, there was a selection of about 23 television shows, various music channels, video games and a moving map. I woke up about two hours before arrival into LAX. Seeing that I was up, the flight attendant came by and offered to convert my bed back into a seat and asked if I wanted my pre-arrival meal. I agreed and again went with the western option. My western pre-arrival meal consisted of a Kurobuta pork and eggplant moussaka salad and fruit plate. The fruit plate was tasty but the eggplant dish was not good at all. Seeing that I didn’t eat much, the flight attendant asked if I wanted something else. Being the hungry kid that I am, I jumped at the opportunity for more food and asked for the Japanese set plate. The Japanese set plate was brought out a few minutes later and I devoured it. The Japanese set plate was slightly better than the eggplant dish but was still not very tasty at all. After my second meal, I had some coffee and enjoyed the most amazing views of the California coast as we made our final approach into LAX. I was lucky enough to catch this EVA Air Boeing 747 cargo jet paralleling us. Service-wise, the flight attendants were incredible. They all spoke English sufficiently and everything was said with sincerity and a smile. They walked the cabin frequently and made sure we were all taken care of. My drink was refilled several times and I never had to ask for anything. I loved that they were proactive in taking care of us. Japan Airlines First Class offers a solid product with some hits and misses. The seats are wide, spacious and comfortable and I really appreciate all the storage spaces at the seat. In bed mode, I got some of the best sleep I have ever had on an airplane. The flight attendants are friendly and proactive in taking care of the passengers and the amenity kit is packed full of quality products. However, Japan Airlines needs to improve on a few things if they truly want to compete with ANA or any of the other Asian carriers. Their ground services are mediocre at best and their in-flight entertainment options and catering are truly lacking. Any improvement in these areas will greatly benefit their overall passenger experience and make them a true 5-star airline contender. 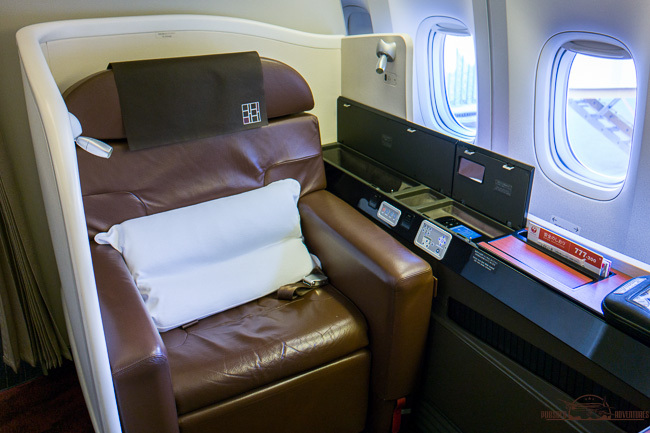 Have you flown JAL first class before? If so, tell me your thoughts in the comments section below.